With over 30 years experience in the stainless steel industry, Danver has been at the forefront of the wave of popularity in stainless steel kitchen items. Danver has seen the trend of stainless steel move from being used exclusively in commercial kitchens to becoming an essential tool in the home kitchen and even outdoor patios. The demand for superior quality stainless steel products has pushed Danver to the top. 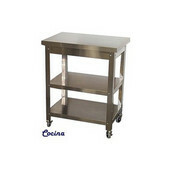 Danver kitchen carts have even been seen on TV's top show, "Designing Spaces." Danver specializes in custom designing, manufacturing and assembling stainless steel for commercial grade and home kitchens. This manufacturer of stainless steel products kept pace with the best practices in the industry to become one of the premier companies in this field. 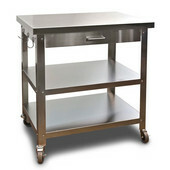 Danver's high quality stainless steel kitchen carts are crafted with commercial precision expressly for well-appointed kitchens.